Discussion in 'GPS Tracks - Central, Texas & Gulf States' started by Cannonshot, Nov 19, 2012. From time to time I get inquires about an adventure route to cross the UP and northern Wisconsin. In the past I often referred people to a couple of exisiting adventure trails I had in place in that area. 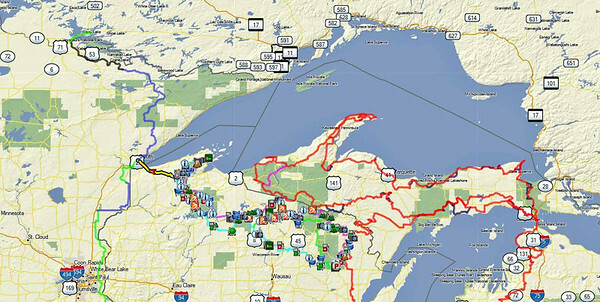 These included the Upper Peninsula Adventure Trail (UPAT) and the Northern Wisconsin Adventure Trail (NWAT). This path, the Trans-Wisconsin/UP Adventure Trail (TWUPAT) will meet the needs of those looking for an entertaining dual sport route that will handle loaded adventure bikes that traverses the Upper Peninsula and Northern Wisconsin from the Mackinac Bridge to Duluth. The track connects to the Trans Minnesota Adventure Trail in Duluth and the GLDS Expedition Michigan at Mackinaw City. Based on a recent inquiry for a trans route that could connect to other trans routes to make up a northern tier path, I put together this adventure route that is entertaining while still being doable on a large adventure bike that could be ridden on two-tracks and other paths. Part of creating this route involved using some of my existing paths but taking out the sections that are great on a small dual sport but unreasonable on a larger bike. I am posting the master GPX here for people to download and use to enjoy this ride. However, I do not intend for the file to be reposted in other locations. It is important for me to update this file from time to time due to property isssues and changing restrictions on travel. The best way to keep a rider from inadvertently getting into trouble, or causing trouble for our recreational interest, is for me to maintain and update this file as required. The route is close to 700 miles long and should take about three days to negotiate. Gas and camping locations, along with other points of interest, are waypointed in the file. If you want to see photographs from the route, you can view segments of my ride reports on ADV for the NWAT and UPAT. GPX can be downloaded below. I love that it is only a long weekend too. That helps with people that have little vacation time available to them... ya know, like me. If you come this way Frank, get in touch. I've got thousands of miles of stuff around this region. I can attached GPX files here again so here it is. Downloaded 959 times from a prior private site.